Stickleback will be playing his first ever gig in the USA, to start off the Lupin Ecstatic series, a new series hosted by our good buddy, Chlorophil, courtesy of Synchronos Recordings and all the lovely people at Lupin! Playing on Thursday, October 3rd at a truly unique location - nestled within the los gatos foothills Lupin is the longest running Naturist resort in America for 78 years! The night will be only $10 and the music will end at 2am. All ticket sales benefit the Lupin Water System Fund. Lupin has had to build a new sand filtration water system so that there can be plenty of drinking water for the resort for years to come. Cosmicleaf Record's 9th Anniversary Celebration! Join us in celebrating this milestone, with our sister label, Cosmicleaf. 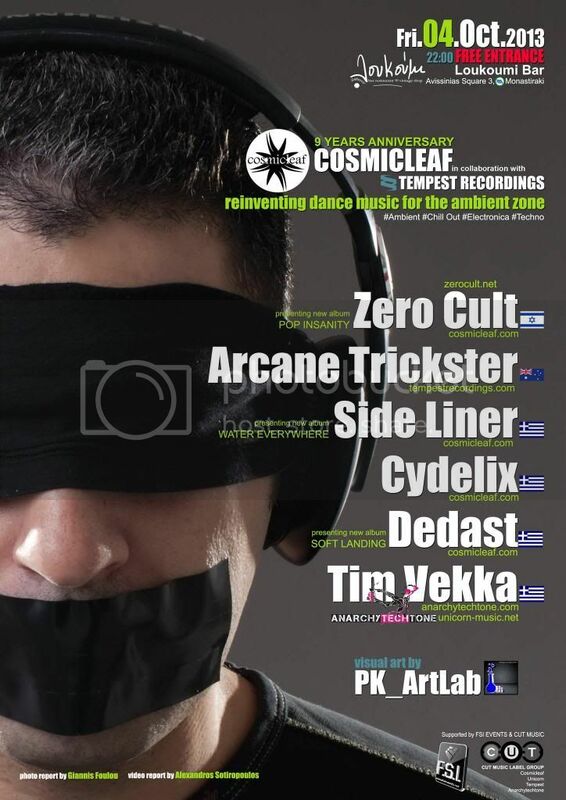 Featuring Tempest's own Arcane Trickster, in his first Greek appearance, alongside Side Liner, Zero Cult, Dedast (formerly Will O' The Wisp) and Cydelix from the Cosmicleaf Label, and https://www.facebook.com/pages/Tim-Vekka/236903223005744" target="_blank">Tim Vekka, from AnarchyTechTone.